Heavy-duty detergents with Chlorinol® bleach to quickly penetrate tough soils and stains. 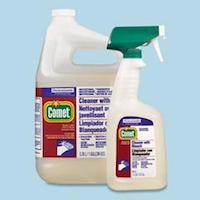 Cuts grease, removes soap scum, deodorizes toilets and urinals, and bleaches out food and beverage stains. Sold by the 32 oz bottle, case of 8 – 32 oz bottles or 3 gallons per case. Trigger Sprayer included w/32 oz bottle size.